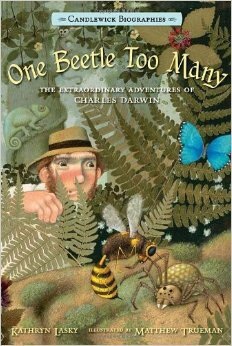 One Beetle Too Many, by Kathryn Lasky with illustrations by Matthew Trueman, is a fabulous introduction to Charles Darwin for children. Published by Candlewick, known for putting out gorgeous all-ages picture books, this is evidently one of about a dozen Candlewick Biographies, “Portraits of People Making History and Shaping the Future,” and I will definitely be checking out other books in the series. Beetle is a relatively short chapter book at forty-three pages, yet each chapter distinguishes itself with the kind of detail a child delights in, like the fact that one time Darwin ran out of places to hold the beetles he was collecting, so he popped one in his mouth! The book is loaded with richly colored, detailed illustrations that reward close study and feel like an integral part of the story. With titles like “Butterflies and Gauchos” and “Seashells on Mountaintops,” each chapter is its own adventure, propelling the reader along further. As a homeschooler, I couldn’t help but be delighted to learn that Darwin was a rotten student and hated school. He was an excellent observer, and had his own methods of study that didn’t fit with the education his father tried to force on him. Lasky shows how important Darwin’s early curiosity was in his development as a scientist, and describes how difficult it was for Darwin to put his ideas about evolution out into the world, which felt like an important facet of his life to share with children, that sometimes the most important ideas you have can give you a stomachache, and that’s okay. Highly recommended.